Whether enjoying a weekend evening or meeting up with friends after work, Vancouver’s sunshine during the summer months makes for great patio dining! This week, I had the pleasure of joining my fellow foodie influencers, Foodgressing and VanFoodies, for a hosted summer patio dinner at West Oak in Yaletown. Beautiful weather with some beautiful ladies catching up and enjoying some delicious food & cocktails makes for a great start to the week. 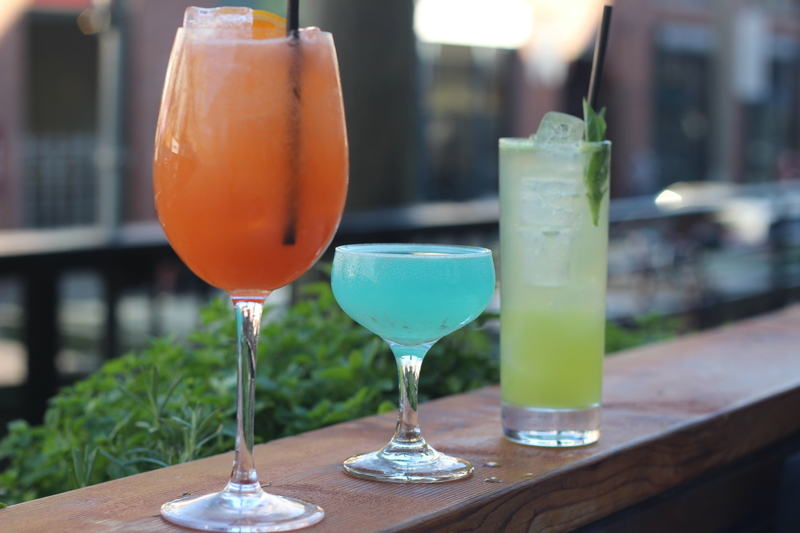 We started off the evening with our wonderful cocktail host, Johnny, who introduced us to a colourful collection of summer cocktails – a sneak peek into drinks being tested for launch later this month: Aperol Spritzer Mimosa, Tiffany Blue, and The Green Thumb. The Aperol Spritzer Mimosa is just that – a combination of Aperol Spritzer with a Mimosa, using fresh grapefruit and orange juice. West Oak prides itself on using fresh made juices vs. those drinks made with concentrate juice. The Tiffany Blue was a beautiful Tiffany coloured cocktail, topped off with a sparkling dazzle of edible silver glitter. The drink sparkles like a Tiffany diamond. This drink is made with Ciroc Apple – a grape based vodka infused with apple. If you like tangy/sour drinks, this is for you! The Green Thumb was my favourite of the evening – combining the fresh flavours of basil, mint, muddled cucumber with gin to provide a refreshing summer patio cocktail. Can I have another please? We were introduced to two great appetizers to accompany our drinks. 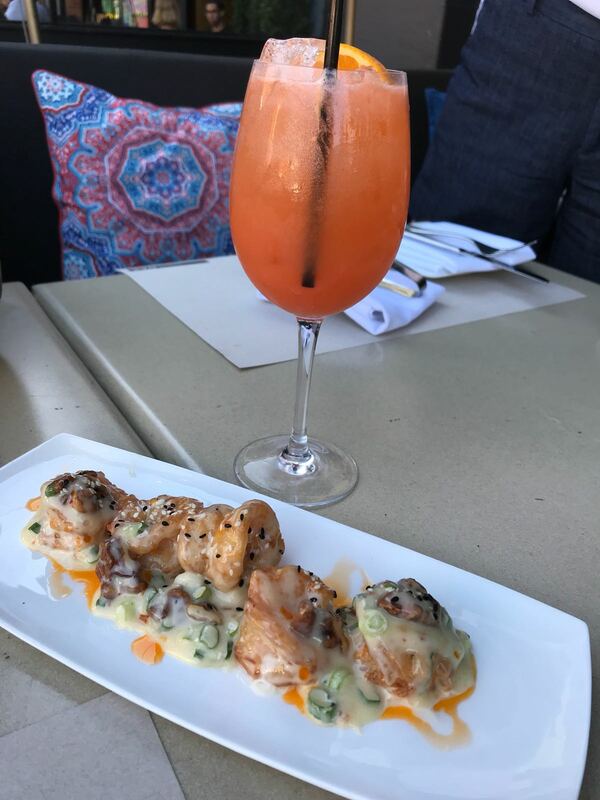 One of the more popular appetizers from the menu is West Oak’s Chinois Prawns – a Chinese and French fusion dish similar to Ebi Mayo. These Oceanwise prawns are pan fried, juicy, and topped with a spicy aioli sauce and candied walnuts. The candied walnuts gave it a nice crunch and extra texture to the dish. 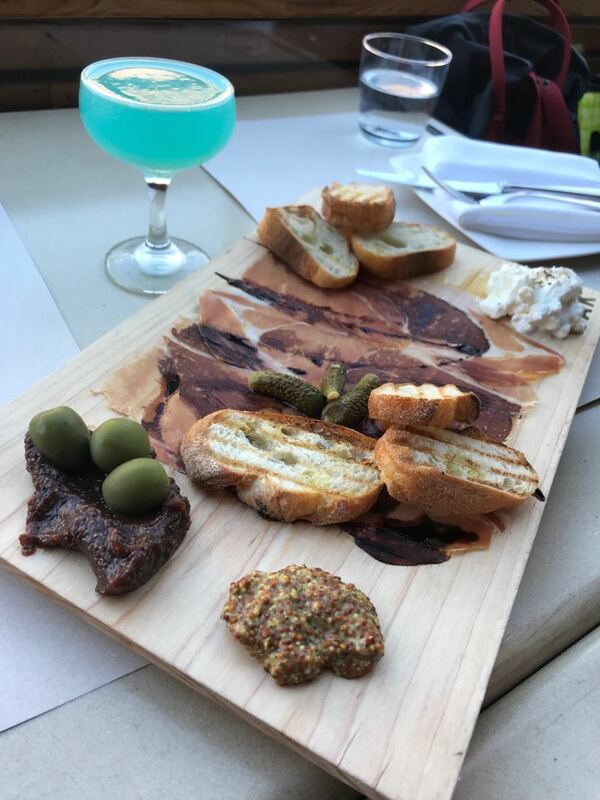 Our 2nd appetizer was the Burrata & Prosciutto platter, which had burrata, prosciutto paired with a freshly made fig jam, dijon, castelvetrano olives, and grilled bread. The freshly made fig jam was a nice compliment to the other items and went well with the grilled bread. We quickly moved onto entrees – and their menu is filled with elevated comfort food dishes – wild scallop risotto, lobster linguine, roasted grain-fed free-range chicken, braised lamb shank, steaks, and more. 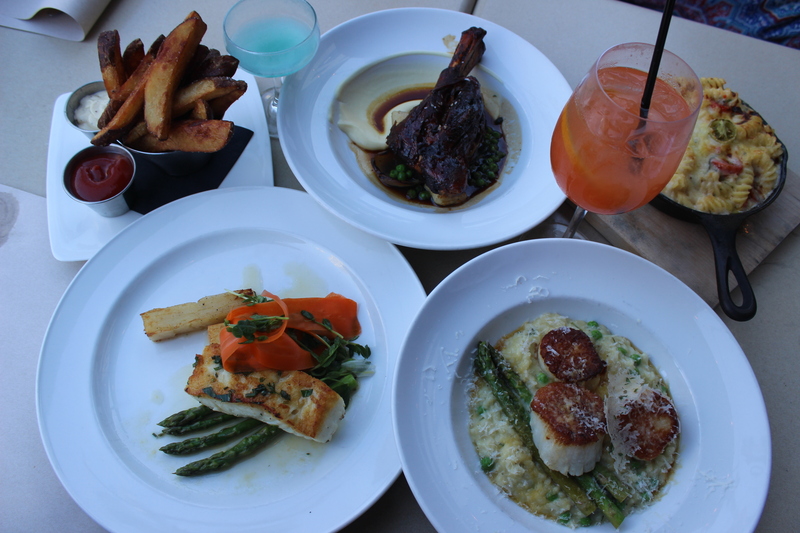 We ended up selecting Oceanwise dishes Fresh Wild Scallops Risotto and Seared Halibut, along with the Braised Lamb Shank. 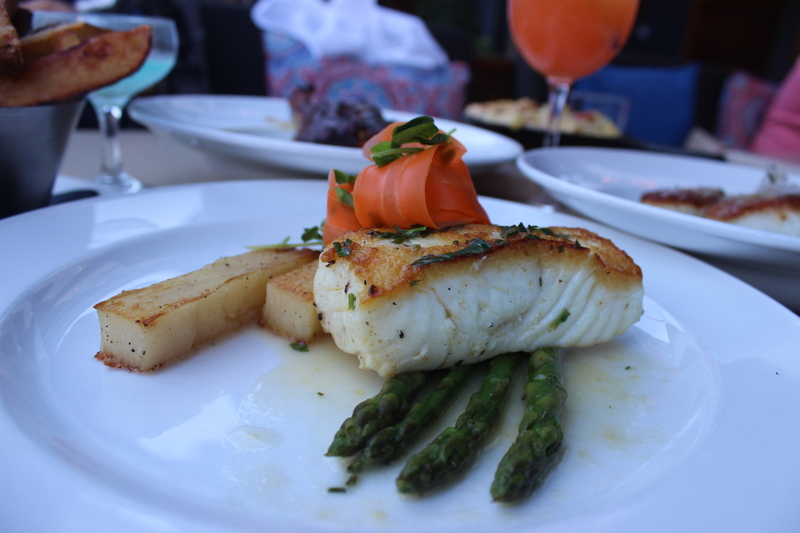 The Seared Halibut dish was accompanied by a potato pave (similar to a scalloped potato but formed into a rectangular shape and minus the dairy), grilled asparagus, accompanied in a lemon butter sauce and citrus root vegetables. The halibut was soft and flakey – cooked with the right consistency. If you like a light dinner entree, this would be perfect. I’m looking forward to comparing this dish next time with their sablefish, which is also offered on their menu, sablefish being one of my favourites. 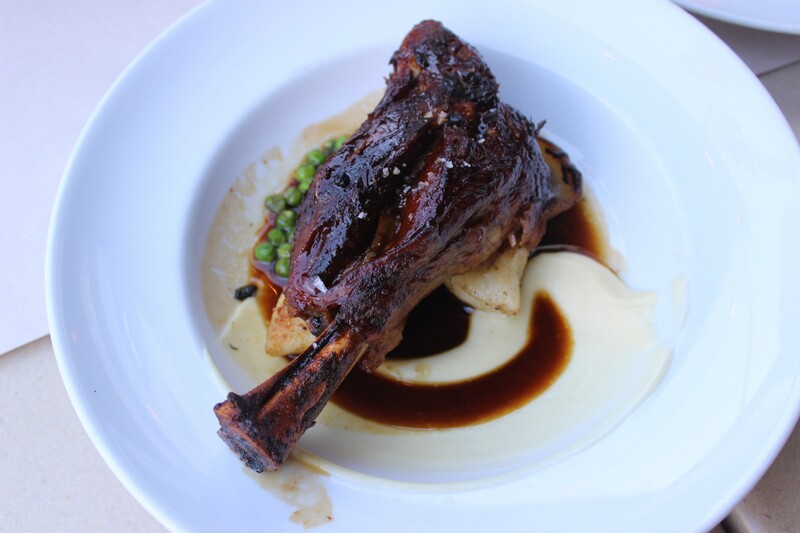 The braised lamb shank (lamb originating from Australia), is accompanied by a fresh made gnocchi, parsnip puree, and minted peas. This dish was flavourful, well balanced in terms of accompanying sides, however was not my favourite of the night. 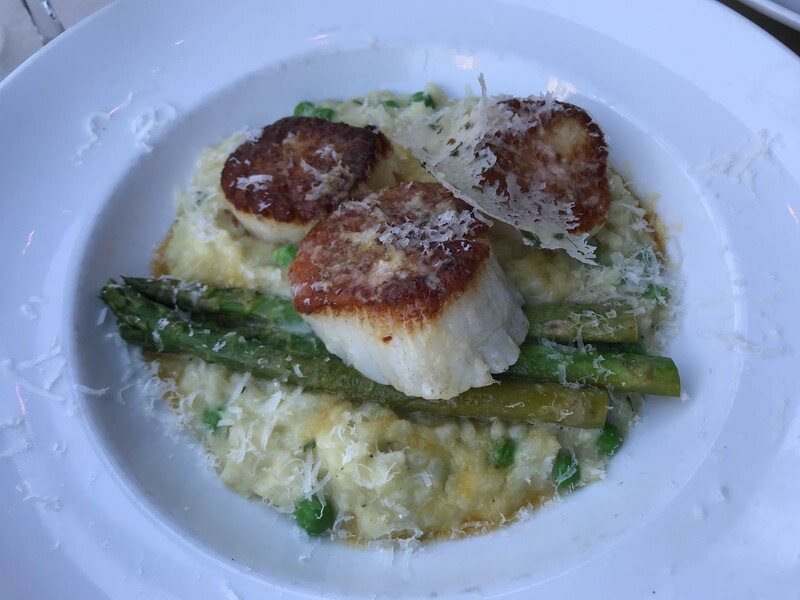 My favourite entree of the evening was the Fresh Wild Scallops paired with a sweet pea and mint risotto, fresh asparagus, white balsamic reduction, lots of parmesan, and a parmesan crisp on top. The scallops were huge – close to 2 inches in diameter, cooked the way Gordon Ramsay would approve. The risotto was rich, yet enjoyable with every spoonful. Accompanying our entrees were two sides – the popular lobster mac & cheese. Although $16 for a side, this lobster mac & cheese could be treated as an entree itself. 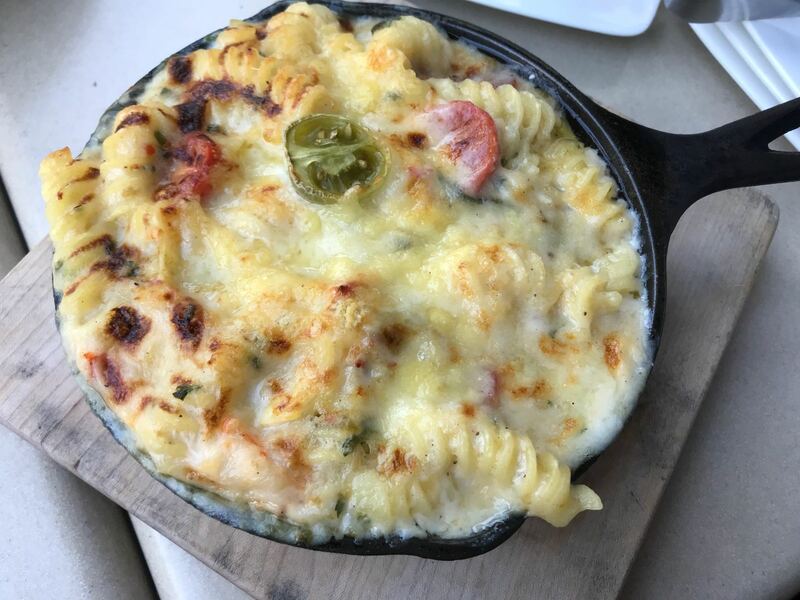 The mini skillet of baked in lobster, mac, and cheese is extra creamy and cheesy, loaded with mouthfuls of lobster. I can see why this is a popular side, perhaps people indulging in this as a meal on its own or to share with a group of friends! 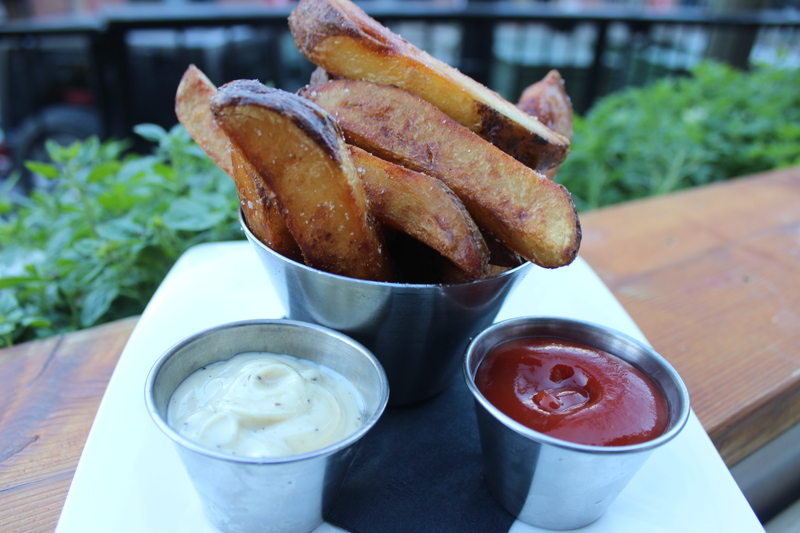 West Oak has created a winner with their Triple Cooked Fries – having gone through 3 different stages of cooking – steaming the potatoes, then baking them, and frying them back before they are ready to serve! They are crispy on the outside and ultra smooth and soft when you bite into them. They also come with ketchup and a creamy truffle mayo dip. Enough food already?! 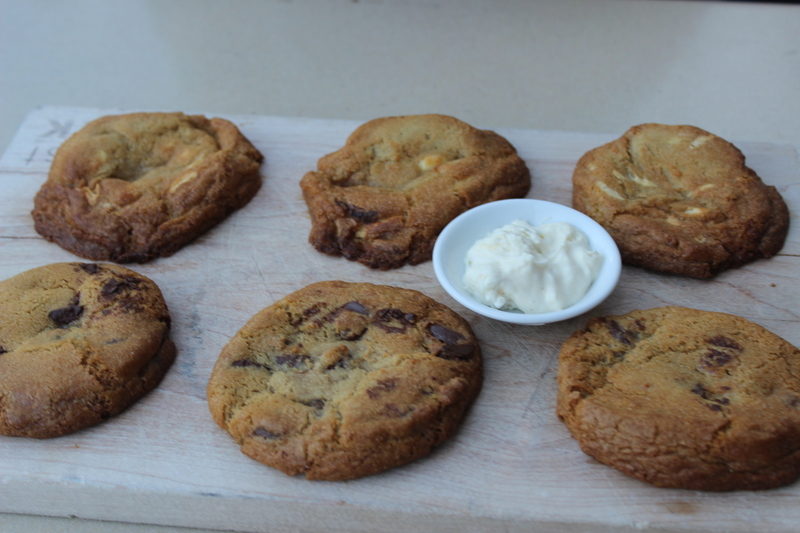 A proper dinner doesn’t end until dessert has been served – in this case, some freshly baked homemade chocolate chip cookies served with a french vanilla bean cream. These cookies, fresh out of the oven, are crispy on the outside, and melt-in-your-mouth gooey chocolate on the inside. The order comes with half dark chocolate chips and half white chocolate chips. Can’t finish them? They’ll be happy to pack them up – still good for the ride home. West Oak offers lunch and dinner, along with a brunch menu on weekends. Appy Hour happens everyday from 3pm-6pm where you can dine on half price appetizers and drink specials all week long. To make your next summer patio dining experience, make a reservation at West Oak: www.westoakvancouver.com. So while I received many encouraging and supporting messages on my Instagram stories about doing the @vancouversunrun - there were a *few* messages that made fun of my slow running or the fact that I approached the finish line with people walking beside me. The one that kinda irritated me focused on the person pushing the stroller by as I struggle to make it to the finish line. . Speaking frankly here, let’s make one thing clear: I’m the type of person that likes to lift people up, and one of my favourite things about myself is that I don’t look for a lot of external validation. I appreciate and cherish the support of my friends and family and I don’t take it for granted. Instagram is a wonderful platform that we can use to lift each other up and encourage others to live to their full and healthier potentials. So when complete strangers chose to focus on the negative struggles of a middle age, overweight mom.... Well, that’s your choice. But let’s go on record saying that it’s not a good choice. Secondly, I recorded my Sun Run because I want to encourage other women to live healthier lives. I made myself a promise last year that I needed to be a healthier and happier role model for my son. And I’m keeping that promise. Besides, if I post about going to a fun event or to a dinner, why not post about doing a 10k run? . Thirdly, you know what? I’m not blind, I see everything you see in this video, the people walking, the stroller, and the middle age, overweight mom struggling to make it to the finish line. But you know what else I see? . . . 🏃‍♀️ Almost four months of training . 🏃‍♀️ Determination . 🏃‍♀️ Will power . 🏃‍♀️ the encouraging and support of my sister @bailamefitness who gave up her Sunday to be with me thru (literally!) rain and hail. . . If those negative comments were meant to crush my spirit or make me doubt myself - they’ve failed miserably. I’m proud of myself, I’m happy with myself. I will continue my health journey strong and confidently. Oh and BTW... I’m only in competition with myself, and that’s the only thing that counts.